Huntington's disease (HD) is a hereditary neurodegenerative disorder caused by an expanded CAG repeat in the HD gene. Both excitotoxicity and oxidative stress have been proposed to play important roles in the pathogenesis of HD. Since no effective treatment is available, this study was designed to explore the therapeutic potential of erythropoietin (EPO), a cytokine that has been found to prevent excitotoxicity, and to promote neurogenesis. To avoid the side effects of a raised hematocrit, we used asialoerythropoietin (asialoEPO), a neuroprotective variant of EPO that lacks erythropoietic effects in mice. R6/2 transgenic HD mice were treated with this cytokine from five to twelve weeks of age. We provide new evidence that cell proliferation in the dentate gyrus of the R6/2 hippocampus is reduced by 50% compared to wild-type littermate controls. However, we found that the asialoEPO treatment did not affect the progression of motor symptoms, weight loss or the neuropathological changes. Furthermore, cell proliferation was not enhanced. We conclude that the chosen protocol of asialoEPO treatment is ineffective in the R6/2 model of HD. We suggest that reduced hippocampal cell proliferation may be an important and novel neuropathological feature in R6 HD mice that could be assessed when evaluating potential therapies. Huntington's disease (HD) is an autosomal dominant hereditary disorder caused by the expansion of a CAG repeat in the HD gene . Affected patients display personality changes and depression before the onset of motor symptoms that include chorea and bradykinesia. Progressive dementia and body weight loss then follow. Death usually occurs within 15–20 years from the onset of symptoms. The neuropathology is characterized by the development of neuronal intranuclear inclusions (NII) containing huntingtin in a subset of neurons and by neuronal death, particularly in the striatum and cerebral cortex. It is thought that the neurons are dysfunctional for many years before they finally succumb to the disease . The pathogenetic mechanisms in HD are far from understood, but have been suggested to involve excitotoxicity and oxidative stress  and possibly an impairment of the ubiquitin proteasome system . There is still no satisfactory treatment for HD. The R6/2 mouse, that expresses exon 1 of the human HD gene with an expanded CAG trinucleotide repeat (around 150 CAG repeats) , is the most studied transgenic mouse model of HD . This model exhibits decreased striatal and total brain size [5, 7], ubiquitinated nuclear and cytoplasmic inclusion bodies , altered levels of neurotransmitters  and their receptors , decreased expression of striatal signaling genes , and progressive motor  and cognitive deficits [13, 14]. There is relatively little, if any, neuronal death in the brains of R6/2 mice [15, 16], but there is widespread loss of retinal ganglion neurons . Erythropoietin (EPO), originally discovered as kidney-produced cytokine regulating haematopoiesis, has been found to enter the brain after peripheral administration, and to be endowed with potent neuroprotective efficacy. It has receptors in brain tissue [18, 19] and beneficial pharmacological effects were described in models of focal ischemia, spinal cord injury, retinal injury, brain trauma and subarachnoid hemorrhage, and also a human phase II stroke study [20–27]. Chronic administration of EPO is linked to the side effects of a dramatically raised hematocrit. Such side effects are not observed upon use of the natural EPO metabolite asialoerythropoietin (asialoEPO), a molecule that otherwise has the same neuroprotective potency as EPO in several animal models of disease . Similar to EPO, asialoEPO has the capacity to cross the intact blood brain barrier . We were interested in studying whether stimulation of EPO-related signaling pathways would have beneficial effects in R6/2 HD mice. We used asialoEPO to selectively trigger the brain EPO receptor in this chronic dosing study. The cytokine asialoEPO was administered three times weekly to R6/2 mice from 5 weeks until 12 weeks of age. The effect of the compound was analyzed with regard to the development of motor symptoms, weight loss, neuropathology and impaired cell proliferation. We found that cell proliferation in the dentate gyrus of the hippocampus, one of the neurogenic zones in the adult brain, was reduced in R6/2 mice, however the asialoEPO treatment did not exert any beneficial effects in this HD mouse model. Mice were assessed weekly from 5 to 12 weeks of age on the rotarod (Fig. 1A). 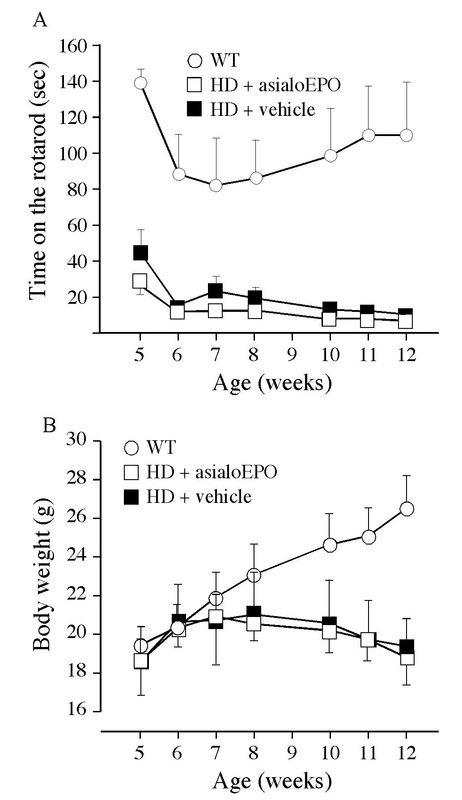 There was no significant effect of asialoEPO on the development of motor deficits in the R6/2 mice as expressed by reduced time spent on the rotarod. The mice were also assessed regarding motor activity in an open field at 10 and 12 weeks of age (Table 1). AsialoEPO did not affect the reduced movement displayed by the R6/2 mice at either of these time points. Mice were assessed weekly with regard to their development of a paw clasping behavior. No wild-type mice showed any signs of clasping. Around 80% of the R6/2 mice in both groups scored one point in clasping at week 7. At week 10, all R6/2 mice scored two points in clasping. However, asialoEPO treatment had no effect on the clasping behavior. No effect of asialoEPO on the decline in rotarod performance or body weight in R6/2 mice. Mice were tested weekly on the rotarod for 3 trials of 180 s each, with the speed of 15 rpm. The value of the mean latency to fall for these three trials was then compared between the mice. The testing began at 5 weeks and continued until 12 weeks of age. The data was analyzed using a two factor repeated measures ANOVA that revealed a significant difference between the groups (F (2, 96) = 16.61, p = 0.0001) and a significant effect of time (F (6, 96) = 4.16, p = 0.0009). However, administration of asialoEPO 3 times weekly from 5 to 12 weeks of age did not significantly affect the decline in rotarod performance in R6/2 mice (A). The mice were also weighed weekly from 5 to 12 weeks of age (B). The data were analyzed using a two factor repeated measures ANOVA that revealed a significant effect of time (F (6, 96) = 1.55, p < 0.0001) and significant difference in the weight over time between the groups (F (12, 96) = 1.32, p < 0.0001). However, there was no effect of asialoEPO on the progressive reduction in body weight in R6/2 mice (F (2, 96) = 1.47, p > 0.05). An important symptom in R6/2 mice is lack of the progressive body weight gain that occurs in wild-type littermates. The weight of the mice was assessed weekly from 5 to 12 weeks of age. AsialoEPO treatment did not affect the reduced body weight in the R6/2 mice (Fig. 1B). The neuropathological characteristics of R6/2 mice include NIIs of mutant huntingtin, which can be assessed using the EM48 antibody . All neuropathological analyses were performed in R6/2 and wild-type mice at the age of 12 weeks. In the five striatal sections assessed per mouse, there were around 426000 ± 31000 NIIs in the vehicle-treated R6/2 mice and 407000 ± 45000 inclusions in the asialoEPO-treated mice (Student's test, n.s.). The unilateral striatal volume, assessed in the medial part of the striatum at the level of the appearance of the posterior anterior commissure, measured 8.23 ± 0.53 mm3 in wild-type mice, 5.14 ± 0.21 mm3 in vehicle-treated R6/2 mice and 5.26 ± 0.07 mm3 in asialoEPO-treated R6/2 mice. A one-factor analysis of variance (ANOVA) revealed a significant difference between both R6/2 groups and the wild-type control group (F (2, 6) = 29.01, p < 0.005 using Bonferroni-Dunn post-hoc test) but no difference between vehicle-treated and asialoEPO-treated R6/2 mice (p > 0.05). The cross mean sectional area of neurons exhibiting dopamine and cAMP regulated phosphoprotein of a molecular weight of 32 kDa (DARPP-32)-immunostaining was 78 ± 6 μm2 in wild-type mice, 55 ± 3 μm2 in vehicle-treated R6/2 mice and 59 ± 1 μm2 in asialoEPO-treated R6/2 mice. Again, there was a significant difference between both R6/2 groups and the wild-type group (one factor ANOVA (F (2, 6) = 9.64, p < 0.05, Bonferroni-Dunn post hoc test) but no difference between asialoEPO- and vehicle-treated R6/2 mice (p > 0.05). We injected bromodeoxyuridine (BrdU) in the R6/2 mice during the last six days of survival to investigate whether the proliferation of cells in neurogenic regions of the brain was altered in R6/2 mice and if asialoEPO would affect the rate of cell proliferation. BrdU incorporates into cells undertaking DNA synthesis and therefore labels proliferating cells. Proliferation of neuronal progenitors, i.e. neurogenesis has been found to occur mainly in the olfactory bulb, the subependymal layer in the subventricular zone, and in the dentate gyrus of the hippocampus. In the subependymal layer, BrdU labeled cells were assessed in 5 sections/mouse. In this region, there was only a trend towards a reduced number of BrdU labeled cells in R6/2 mice compared to their wild-type littermates at the age of 12 weeks (Fig. 2A). In the dentate gyrus, we found that there was a reduced number of BrdU labeled cells in R6/2 mice compared to the wild-type mice (Fig. 2B and 3). However, the administration of asialoEPO, which has been shown to have neurogenic properties , was not able to reverse this. Stereological assessment of the total number of neuronal nuclei (NeuN)-positive neurons in the dentate gyrus revealed that there were 117000 ± 15000 neurons in wild-type mice, 142000 ± 5000 neurons in vehicle-treated R6/2 mice and 158000 ± 20000 neurons in asialoEPO-treated R6/2 mice (one factor ANOVA F (2, 9) = 1.91, p > 0.05). 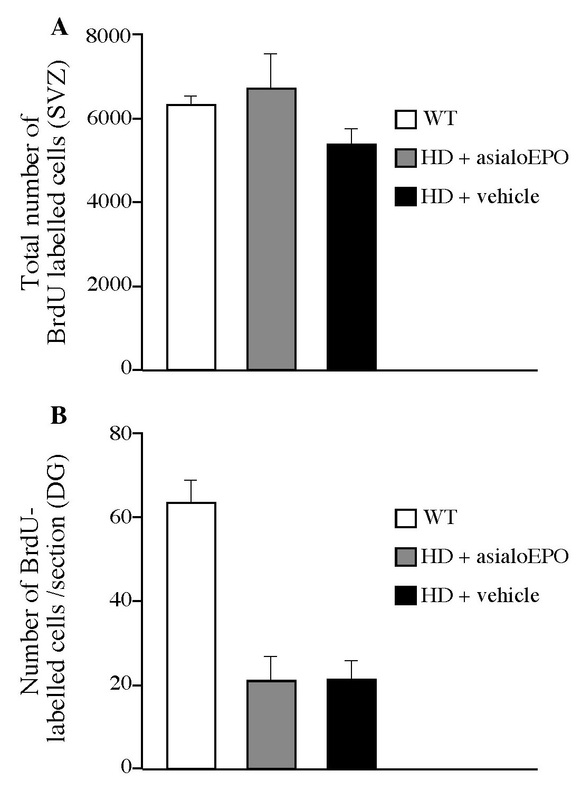 Reduced BrdU labeling in R6/2 mice, but no reversal by asialoEPO. All mice were injected with 50 mg/kg of BrdU i.p. every 12 h for their last six days of survival in order to assess whether asialoEPO would affect cell proliferation in the R6/2 mice at the age of 12 weeks. The number of BrdU labeled cells was assessed by stereology in the subventricular zone in five striatal sections/mouse. In this region, there was only a trend towards a reduced number of BrdU labeled cells in R6/2 mice compared to their wild-type littermates (A; one factor ANOVA, F (2, 16) = 1.63, n.s.). In the dentate gyrus, BrdU labeled cells were assessed in 7–9 sections/mouse from the first anterior aspect of the structure, and the number was expressed as the average number per section (B). The data were analyzed using a one factor ANOVA (F (2, 16) = 23.50, p < 0.0001) that revealed a significant difference between the groups. In this region, we found that there was a reduced number of BrdU labeled cells in R6/2 mice compared to wild-type mice (Bonferroni-Dunn post-hoc test, p < 0.0001). However, the administration of asialoEPO was not able to reverse the reduced cell proliferation (Bonferroni-Dunn post-hoc test, p > 0.05). BrdU labeled cells in the dentate gyrus of the hippocampus. Photomicrographs showing representative NeuN staining of the dentate gyrus in a wild-type (A), a vehicle-treated R6/2 (B) and an asialoEPO-treated R6/2 (C) mouse of 12 weeks of age. 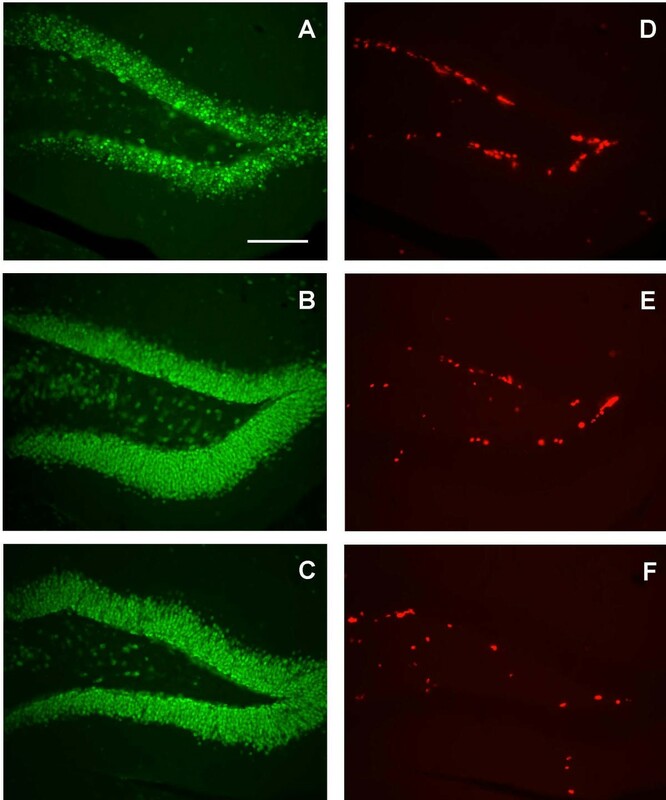 Photomicrographs showing representative BrdU labeling in adjacent sections of the dentate gyrus in a wild-type (D), a vehicle-treated R6/2 (E) and an asialoEPO-treated R6/2 (F) mouse. Scale bar 100 μm. There is still no satisfactory treatment available for HD, nor are the underlying disease mechanisms known. Excitotoxicity and oxidative stress have been suggested to be involved in the pathogenesis, and administration of EPO has been shown to be protective against such insults. We therefore studied whether asialoEPO, an EPO analogue, exerts beneficial effects in R6/2 HD mice. We injected R6/2 mice 3 times weekly with asialoEPO from five to twelve weeks of age, and assessed the effects of the treatment by analyzing rotarod; paw clasping; general activity in the open field; body weight; the frequency of striatal huntingtin inclusions; cross sectional area of striatal projection neurons; volume of the striatum; and the number of proliferating cells in two neurogenic brain regions. We did not detect beneficial effects of the synthetic analogue of EPO in any of the assessed parameters. However, we did not measure whether asialoEPO provided neuroprotection of retinal ganglion cells, which are known to die in R6/2 mice , and future studies to examine this possibility are warranted. There may be several reasons why asialoEPO did not have any effect in the R6/2 mice. It has previously been shown that EPO has neuroprotective effects in acute neurodegenerative paradigms, such as hypoxia and ischemia [20, 24, 31]. The only study published so far with asialoEPO also focused on acute models . However, the R6/2 model provides a chronic neuropathological model without any cell death. Moreover, one of the proposed neuroprotective mechanisms for EPO relies upon a functional transcriptional machinery. EPO is thought to activate EPO receptors that are linked to the Janus kinase 2 (Jak2) pathway. The activation of this pathway has been linked to the activation and nuclear translocation of nuclear factor-kB (NFkB), which once in the nucleus, can lead to the up-regulation of neuroprotective genes (e.g., the caspase inhibitors: X-linked inhibitor of apoptosis proteins, XIAP, and cellular inhibitor of apoptosis proteins-2, c-IAP2) . There are several studies showing transcriptional abnormalities in R6/2 mice . Therefore, it is possible that EPO can not induce the necessary up-regulation of neuroprotective genes that would be needed in order to exert its neuroprotective effect. Several other compounds have been found to exert moderate ameliorative effects on the behavior and neuropathology of R6/2 mice and increase their survival with up to 15% [33–36]. Although the pathological events underlying the development of a phenotype in the R6/2 mice are not fully understood, those studies demonstrate that the mouse model is in principle amenable to therapy. Adult hippocampal neurogenesis was described already forty years ago, but it is only recently that this phenomenon has been accepted fully [37, 38]. Proliferation and maturation of neurons are now known to occur in specific regions of the adult brain; i.e. the olfactory bulb, the subependymal layer and the dentate gyrus of the hippocampus. Although the functional impact of adult neurogenesis is not yet known, it has been suggested to be involved in important neuronal functions such as learning and memory. It is a highly dynamic process with a number of controlling factors and regulators [38–40]. Briefly, it can be upregulated by enriched environment, exercise, learning, estrogen, antidepressant drugs, electroconvulsive therapy and delivery of growth factors such as brain derived neurotrophic factor (BDNF) and insulin growth factor 1 (IGF1). It is downregulated by stress, glucocorticoids, inflammation, excitotoxicity, opiate intake, and during aging. The underlying molecular mechanisms controlling neurogenesis are not fully understood, but may involve activation of the cAMP response-element binding protein (CREB) cascade. Neurogenesis in the adult brain provides a thrilling possibility to manipulate the endogenous restorative capacity in neurodegenerative disorders. Also, it is not fully explored if or to what extent the neurogenic process is altered in neurodegenerative diseases and whether such changes even may contribute to the symptomatology . This study is, to the best of our knowledge, the first where R6/2 HD mice were assessed with regard to BrdU labeling in neurogenic zones in the brain. By following a protocol that was aimed to evaluate cell proliferation (i.e., six days of BrdU injection followed by perfusion of the mice 12 h after the last injection), we found a reduction of BrdU-positive cells in the R6/2 dentate gyrus, which is rich in neurons. In this region, the majority (80%) of the surviving BrdU-labeled cells are known to mature into neurons . BrdU is a nucleotide precursor that incorporates into the DNA of dividing cells, and is commonly used as a marker of cell genesis. As BrdU is a thymidine analogue, it could also label cells that are undergoing DNA repair. However, several experimental data argue against that being a major contributor to the labeled cells in the dentate gyrus. In the dentate gyrus, mitotic cells are present in the neurogenic zones where BrdU labeling has been found, BrdU positive cells have been shown to mature into neurons, irradiation reduces the amount of BrdU labeling while DNA repair is increased, and no BrdU labeling has been detected in apoptotic cells . The underlying mechanism for the reduced cell proliferation in the R6/2 mice is not yet known. Recent reports show that inflammation and microglial activation impair hippocampal neurogenesis in rats [43, 44]. However, microglia density is decreased and their structural morphology is abnormal already at 7 weeks in R6/2 mice , rendering this theory less likely. Other factors, such as stress, increased glucocorticoids and an accelerated aging process could also be involved in reducing cell proliferation in the R6/2 mice. Alternatively, positive regulators of neurogenesis could be decreased in the HD mice. Interestingly, BDNF reductions have been found in HD patients  and decreased CREB-mediated transcription has been described in HD models . However the extent of these changes are not fully explored in R6/2 mice. Noteworthy is that the mice in the present study had been subjected to many weekly injections and behavioral handling, which could both be stimulating in a similar fashion as enriched environment, or stressful in a harmful way. Enriched environment and stress have been shown to affect neurogenesis in opposite directions [40, 48]. In order to investigate to what extent neurogenesis is affected in R6/2 mice and at what disease stage the change occurs, mice that are not subjected to handling nor testing should be used. It will then be important to consider whether the reduced BrdU labeling is indeed due to a decreased number of proliferating cells or if it is a result of an increased death rate of the proliferating cells. It may be that the turnover of neurons is reduced in the R6/2 dentate gyrus, without affecting the net number of neurons. In support of this is the absence of a difference in total neuronal number in the dentate gyrus between R6/2 and wild-type mice in this study. It is possible that altered neurogenesis is an important pathological hallmark in HD. Recently it was reported that there is an increased number of proliferating cells in the subependymal layer adjacent to the striatum of HD brains . These cells were stained with the cell cycle marker proliferating cell nuclear antigen (PCNA) and 50% of the cells were found to coexpress glial fibrilliary acidic protein (GFAP) and only 5% expressed the neuronal marker βIII-tubulin . The neurogenesis in the dentate gyrus was never examined in the human HD brains. However, the relationship between our data using BrdU labeling and the published human data based on PCNA immunohistochemistry is unclear at this point. In this study, there was no effect of asialoEPO on the reduced BrdU labeling in the R6/2 mice. There are only a few studies on the role of EPO in neurogenesis in the literature today. It has been shown that EPO receptors are important for normal brain development and that lack of EPO receptors results in less neuronal progenitor cells . Interestingly, the effect of EPO may be region-dependent as infusion of EPO into the lateral ventricles of rats decreased the number of BrdU labeled cells in the subventricular zone but had the opposite effect in the olfactory bulb . To summarize, the EPO analogue asialoEPO at the dosing protocol used here, is ineffective in the R6/2 model of HD. However, a definite conclusion regarding the lack of asialoEPO effects in R6/2 mice awaits future studies in the retina. Reduced hippocampal BrdU labeling in end-stage R6/2 mice is a novel, and maybe, important neuropathological feature in these mice. Future studies will shed light on the significance of this alteration and may facilitate the understanding of the pathological process in HD. Transgenic HD mice of the R6/2 line were originally purchased from Jackson Laboratories (Bar Harbor, ME, USA) and the colony was maintained by breeding heterozygous R6/2 males with females from their background strain (F1 of CBA × C57Bl/6). Tails of the offspring were used to obtain DNA for determination of the genotype using a polymerase chain reaction assay . The length of the CAG repeat in our R6/2 colony was analyzed, and was found to be stable at 142 ± 0.7 CAG repeats (n = 18, from two different generations). The mice were housed in groups with ad libitum access to food and water at a 12 h light/dark cycle. The experimental procedures were approved by the ethical committee at Lund University. Mice were weighed once a week during the whole experiment. Mice from the same litters were divided into three groups (n= 6–7 for each group). AsialoEPO was synthesized from EPO exactly as described . One group of R6/2 mice was injected with 2.6 nmol/kg (80 μg/kg) intraperitoneally (i.p.) in phosphate buffered saline (PBS) three times per week, starting from 5 weeks of age until they reached 12 weeks of age. Another group of R6/2 mice and their wild-type littermates were injected (i.p.) with the vehicle (PBS) following the same schedule. Mice were trained on the rotarod for two days before the testing began at 5 weeks of age. On the first training day each mouse was placed on the rotarod for 120 s at a speed of 5 rpm. On the second day, mice were given two separate 120 s sessions at 10 rpm and one at 15 rpm. The mice were tested on the following day with 3 trials at 15 rpm for 180 s each. The mean value of the latency to fall for these 3 trials was compared between the mice. Mice were tested once a week using a similar block of 2 trials at ages 5, 6, 7, 8, 10, 11 and 12 weeks. At the same ages studied for the rotarod, mice were subjected to the paw clasping test. To score the presence of paw clasping, mice were suspended by the tail 10 cm above the cage for 20 s. The paw clasping was scored from zero to two points. Absence of paw clasping behavior or only the front legs pressed together yielded zero points. If mice pressed front paws to the stomach, one point was given. If front paws touched hind legs, or both front and hind legs pressed against the stomach, two points were noted. All clasping tests were scored by an individual blind to the genotype of the mice. The general motor activity was assessed in an open field. The open field box was divided into 25 squares (5 × 5 cm each). The mice were analyzed at 10 and 12 weeks. They were allowed to habituate for 10 min and then their activity was recorded for the following 10 min. The number of squares that the mice entered during the last 2 min of the recording session was evaluated. This short time in the end of the session was chosen in order to increase the habituation period, when the activity is increased in normal animals due to their exploratory behavior. This increase in activity is the greatest during the first 20 min in a new environment . In order to assess the genesis of new cells in the brains, all mice were injected with 50 mg/kg of the thymidine analogue BrdU (in PBS, pH 7,2) i.p. every 12 h for their last six days of survival. The mice were sacrificed 18 h after the last BrdU injection. At 12 weeks of age, all mice were deeply anesthetized with pentobarbital and transcardially perfused with saline followed by paraformaldehyde (4%) in 0.1 M PBS. The brains were left in the fixative overnight and then dehydrated in 20% sucrose/0.1 M phosphate buffer. Coronal sections were cut at four series throughout the brain on a freezing microtome at a thickness of 40 μm and collected in PBS. Free-floating sections were processed for NeuN immunohistochemistry. Briefly, one series of sections was quenched in 3% hydrogen peroxide/10% methanol in 0.1 M PBS for 15 min and then rinsed three times. The sections were preincubated for 1 h in 5% normal horse serum (NHS) and 0.25% Triton X-100 in PBS and then incubated overnight at room temperature with a primary antibody against NeuN (diluted 1:1000, Chemicon, Temecula, CA, USA) in PBS containing 2% NHS. After incubation with a biotinylated horse anti-mouse antibody (1: 200; Dakopatts, Copenhagen, Denmark) for 1 h, the bound antibodies were visualized using an avidin-biotin-peroxidase complex system (Vectastain ABC Elite Kit, Vector labs, Burlingame, CA, USA). To detect the presence of huntingtin inclusions, the EM48 antibody was used at a dilution of 1:500 (Chemicon). BrdU staining was detected using a mouse anti-BrdU antibody (1:50; Dako, Glostrup, Denmark). To visualize striatal neurons and the outer anatomical borders of the striatum, the DARPP-32 antibody was used (1: 1000; Chemicon). All morphological analyses was performed on blind-coded slides using an Olympus C.A.S.T.-Grid system (Olympus Denmark A/S, Albertslund, Denmark) composed of an Olympus BH2 microscope and an X-Y step motor run by an IBM PC computer. The number of EM48-immunopositive neurons in the striatum was assessed in five sections from each striatum, using stereological principles . The level of these sections began at 2 sections anterior to the appearance of the posterior anterior commissure. The number of BrdU-immunopositive cells in the dentate gyrus was assessed in 7–9 sections/mouse starting from the first anterior aspect of the structure, and the number was expressed as the average number per section. The total number of BrdU labeled cells in the subventricular zone (located adjacent to the ventricle in the neostriatum) was assessed using stereology in five striatal sections per mouse. Four mice from each group were randomly selected and the striatal area was delineated in five adjacent sections (in a 1:4 series) of the striatum processed for DARPP-32 immunohistochemistry. The level of these sections began at 2 sections anterior to the appearance of the posterior anterior commissure. The volume was calculated, taking into account the frequency of sections (1:4) and their thickness (0.04 mm), according to the Cavalieri principle . Using the stereological equipment, the surface area of 45 randomly selected DARPP-32 cell bodies/striatum was also assessed (15 neurons/section in three sections/mouse). The number of NeuN-immunopositive cells in the dentate gyrus was assessed in the same mice using stereology (6 sections/mouse, starting from the first anterior aspect of the structure). The data were analyzed with a one- or two-factor ANOVA with repeated measures when appropriate, or un-paired Student's t-tests, using the Statview 5.4 package (Abacus concepts, Berkely, CA, USA). Data are presented as mean ± SEM. A p value of < 0.05 was considered significant. We thank Elsy Ling, Birgit Haraldsson, Britt Lindberg, Laurent Roybon and Bengt Mattsson for excellent technical assistance. We acknowledge the assistance of determining the CAG repeat length by Anj Mahal and Gilian Bates, London. JG is a Marie Curie Fellow. PB is supported by the Swedish Research Council and the Hereditary Disease Foundation. ÅP is supported by the Swedish Brain Foundation. JG carried out the BrdU injections, the behavioral testing and immunohistochemical analysis. ML provided the asialoEPO and conceived of the study. NP participated in the BrdU injections. PB participated in the design of the study. ÅP participated in the BrdU injections, the perfusion and the design of the study as well as drafted the manuscript. All authors read and approved the final manuscript.